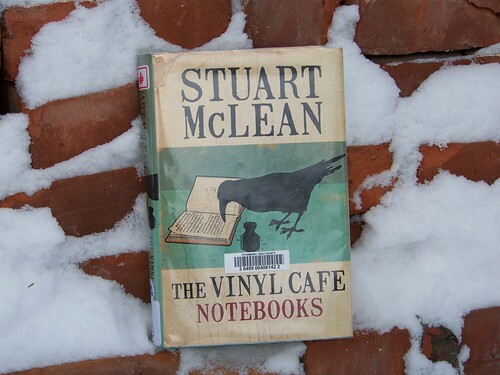 The Vinyl Cafe Notebooks by Stuart McLean. Penguin Canada 2010. When our family got together on Christmas Eve, while we were recovering from a bountiful dinner, I got out Stuart McLean’s Home from the Vinyl Cafe: A Year of Stories, and we read several stories aloud. Home from the Vinyl Cafe is pretty much my favorite among the ‘Dave and Morley’ books. It opens with a Christmas story, ‘Dave Cooks the Turkey’. This tale has proved so popular that it has been published on its own in a slim volume. I like ‘Dave Cooks the Turkey’, but it’s not my favorite, and it wasn’t one of the stories we chose to read aloud. We went with ‘On the Roof’, in which Dave’s tongue becomes stuck to the metal TV antenna while he is stringing Christmas lights on the roof. We followed up with ‘Polly Anderson’s Christmas Party’, in which Dave accidentally spikes the children’s punch instead of the adult’s bowl. Don’t know Dave and Morley and their kids, Stephanie and Sam? Wow! You’re in for a treat! Hurry down to your library or bookstore today and get reading. You’ll want to start with the first entry in the Vinyl Cafe series, Stories from the Vinyl Cafe, because you won’t want to miss a single tale. Or, if you’d like to meet Stuart himself, drop by the Vinyl Cafe website. You can download a podcast of his popular show, which in this part of the world can be heard on Sundays at noon on CBC radio. McLean’s latest book, The Vinyl Cafe Notebooks, isn’t a collection of stories about Dave and Morley. Rather, it is compendium of short essays and remembrances covering people and places from McLean’s travels and, well, life in general. If you have listened to Stuart’s show, you will hear his lilting, sing-song voice in many of these short entries, while others are more personal, wistful. As McLean travels all around Canada with his show, he could probably do his own version of “I’ve Been Everywhere“. The small town of Iroquois gets a mention in the opening pages of Notebooks, as McLean stops to watch a ship go through the locks. One of my favorite ‘place’ stories from Notebooks was ‘The Tall Grass Prairie Bread Company’, about a church congregation in Winnipeg that decided to do something to help their community and ended up with a bakery that succeeded beyond all their wildest expectations. After reading their story, I enjoyed checking out the Tall Grass Prairie Bread Company website. Oh, I progressed. I wasn’t hopeless. My right hand conquered the treble clef in a boyish way, but my left hand lumbered around the bass notes without any confidence, like a dim cousin trying to find his way along a crowded street, always stopping to stare at the street signs myopically and falling behind everyone else. Another favorite was ‘Watchfulness’. McLean begins by observing that a garden offers a lot of opportunities to hone your watching skills. From there he proceeds to other things that he watches. Watching his weight, watching his health, not watching the television news, or, sadly, over you. Which I would be happy to do if you would call when you weren’t in such a hurry to get to wherever it is you are going today. So I am not watching over you, not today, but will be soon enough. I hope. In the meantime the morning glory will have to do. I read my library copy over a few days, but The Vinyl Cafe Notebooks would be a nice addition to any bookshelf. Then, you could take it down when you were feeling a little blue, sip a cup of tea, maybe, and read a few pages. Soon you would feel like you were in the company of an old friend, an understanding friend, someone who will, for a little while, watch over you. This entry was posted in humour and tagged Stuart McLean, The Vinyl Cafe Notebooks.. Bookmark the permalink.